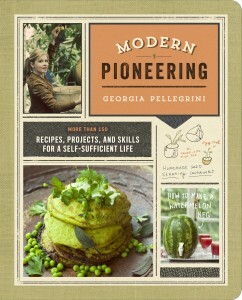 Modern Pioneering is finally here and with a new book comes a new book tour. I’m so excited to be able to share the project I’ve been working on for so long with all of you and I hope you’ll meet me along the way to share how you’ve become modern pioneers with me! Will I be coming to a city near you? Sign up HERE to get a VIP invite, full of swag bags, good drink, and colorful sharpies. When: Wednesday, April 2, 2-4 p.m. Details: Georgia will be visiting the Junk Gypsy World Headquarters! 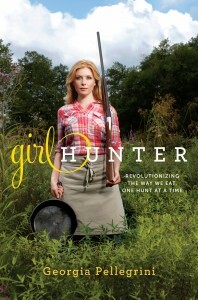 The world traveler, classically-trained chef, and girl hunter will be spending the afternoon sharing her modern pioneering tips and taking part in a book signing. When: Tuesday April 8, 5-8 p.m. Details: Georgia will be signing books at the Paul Michael Co! Delicious food and drink provided by Charlie G’s. When: Thursday, April 17, 6 – 8 p.m.
*Goody bags for the first 50 guests / Wine provided by Fowles Wine / Valet parking is available at the hotel for $7. Alternative parking available at Premium Parking Garage two blocks away at 535 Chartres Street. When: Sunday, April 27, 1:30 – 2 p.m. 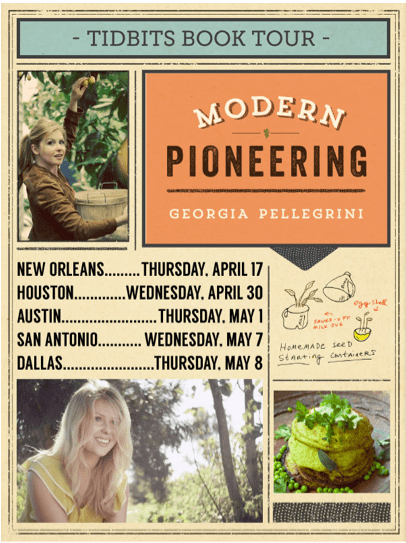 Details: After watching her demo live in the festival tents, meet Georgia who will be signing books at the Austin Food & Wine Festival book signing tent (you must have a pass to the festival to be at the signing). 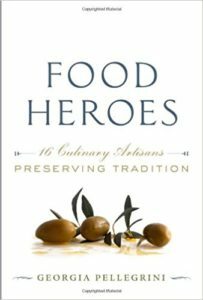 When: Wednesday, April 30, 6 – 8 p.m.
*Ticket price includes signed copy of book, refreshments and a tote bag with kitchen essentials. When: Thursday, May 1, 6 – 8 p.m. When: Thursday, May 8, 6 – 8 p.m.
Are you coming to the Northern Virgina area on your book tour? G, my oldest daughter recently dug the bait for, caught and cleaned her first mess of panfish. That and she watched her BF cook em up using a Thai salt crust recipe. They both really enjoyed reading my copy of “… heros” so I know they will appreciate receiving this new book of yours after I get done with it. That’s wonderful! Hopefully she’ll get more inspiration from the book.